Webmaster’s Tools provides powerful insights into what is really going on with your website. You may have Google Analytics and think that is enough, but Google Analytics only shows you what people did after they clicked through to your website. Webmaster’s tools provides information about how your website is doing in the search results before they click, and can help you understand what content on your website isn’t working. You get a “Google’s eye view” of your website’s health (broken links, malware, etc. ), Traffic (what terms your website is ranking for and what is and isn’t driving traffic), Links to your site, Optimization tips and more. Perhaps the most critical thing is that Google communicates with website owners through webmasters tools. If they find a virus, or something like when a major shift in traffic occurs, you will likely find out about it here first. Go here to sign-up, you’ll be prompted to login with your “Google account”. When I do this for customers, I like to use something generic like google@yourbusessurl.com. I do this because it is easily identifiable what the account is for and I can redirect it to the most appropriate people in the company. Note: this does not have to be a gmail account, but it does have to be an real email address! What you don’t want to do is sign up with your personal Gmail account or the gmail account of your marketing person. There are many reasons for this, but if you need to give someone else access, you don’t want them to have access to your personal emails and you want to be sure you have control of the account if someone leaves. An alias like google@yourbusessurl.com is perfect and one it is setup, you can provide access to other accounts. If you are already using your personal email for Google Analytics you should probably add the generic address access to that account before the next step. Once you add your website, you’ll need to verify ownership of the website. This can be done several ways, the original method of uploading a file (provided by Google) to your website, is still many times the simplest, but if you’re using Asynchronous tagging for Google Analytics, Webmaster’s Tools will allow that as well. Once verified, it may take several days for statistics to be available. But soon you will have great insights into how Google views your website. Be sure to set message forwarding, so you will get an email notifications if there is an issue. 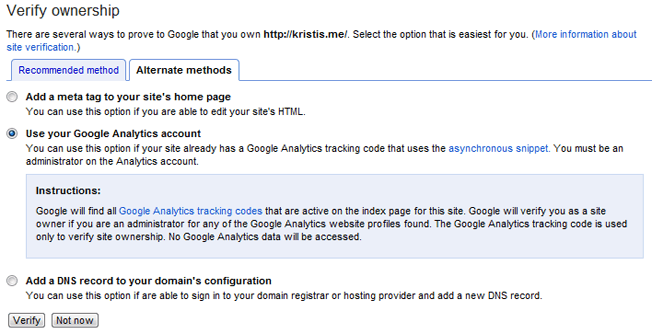 On the Webmaster Tools home page, on the left-hand menu, click Preferences. In the Email notifications section, select the type of messages you want forwarded. You can choose to forward all messages or only critical messages that need attention right away. There are a number of additional of settings you should take care of in Webmaster’s Tools, including setting your country, preferred domain, and adding a link to a sitemap that are beyond the scope of this post, but we would be happy to assist you with those efforts.